This blacktie event, chaired by Bobbi Holland and Chuck Hilliar, was very, very successful, selling out nearly three months in advance. Ticket prices ranged from $750 to sponsorships of $50,000, but attendance was limited to about 414 in number, which is the seating capacity of the museum’s Annenberg Theater. Bobbi and Chuck thanked their many supporters and gave a shout out to MAC President Gloria Scoby who was in the audience. 1. A lavish cocktail hour in the museum’s main gallery, where the stunning gowns of the ladies present drew as much attention as the other works of art on display. 2. An emotional and deserving program on the Annenberg stage, honoring Dr. Steven A. Nash, the museum’s JoAnn McGrath executive director, who is retiring after supervising eight years of unprecedented growth and stature at the museum. 4. An extravagant double-entree dinner of filet mignon and salmon, catered by Lynne and Brad Toles of Savoury’s. This event, as always, was produced by the Museum Associates Council (MAC) the dynamic volunteer group which raised over $960,000 with this event and is on track to raise a total of over $1.4 million for the museum this season. Eight major factors in this astounding success were the event’s eight double platinum sponsors: Helene V. Galen, Harold B. Matzner, Donna MacMillan, JoAnn McGrath, Dorothy Meyerman (in honor of her late husband, Harold Meyerman) , Stacey and Greg Renker, Faye Sarkowsky and members of The Wells Fargo Foundation. 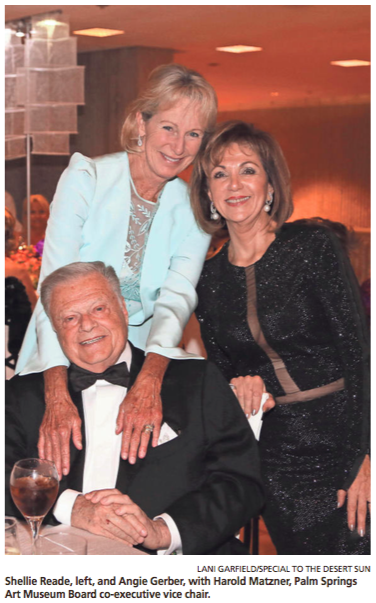 Aside from the fun, beauty, sentiment and entertainment of the evening, the most important news was delivered by two philanthropic speakers, board executive vice chairs Harold Matzner and Donna MacMillan, who spoke from the stage to honor Dr. Nash. Matzner and MacMillan thanked Dr. Nash for his tireless efforts and outstanding creative vision that transformed the Palm Springs Art Museum into what it is today. “Steve did an amazing job of building the Museum’s collection and his artistic taste is reflected in the bright and attractive redesign of the Museum’s interior, a look of which we are all proud and which has elevated the Museum’s brand.” Under Dr. Nash’s leadership, the museum successfully underwent multiple renovations, and opened two satellite locations, Palm Springs Art Museum in Palm Desert, The Galen and Faye Sarkowsky Sculpture Garden and the Architecture and Design Center, Edwards Harris Pavilion in downtown Palm Springs. Matzner and MacMillan were followed by new Board president and acting Chairman Jane Saltonstall who told the audience “for many years now, you have been greeted at our galas and many other events by our extraordinary Chairman emeritus, Harold J. Meyerman, who passed earlier this year. Tonight, I ask you to join me in keeping Harold foremost in our memories as we celebrate the museum he loved and loved leading so very much.” She also introduced new executive director Elizabeth Armstrong, who was greeted warmly by the audience. A large, dynamic new sculpture by Thomas Houseago, recently purchased by the museum, is now in place at the main entrance to the museum, with a plaque stating that it is in honor of Dr. Nash and his many contributions to the museum. The formal program closed with the Broadway-style performance of Mueller and Spector singing songs from Broadway hits spanning several generations, followed by dinner and dancing in the main museum gallery.